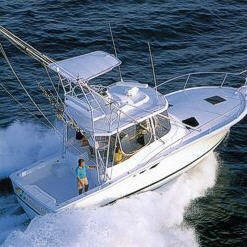 The Reel Steal Rhode Island Fishing Charter Boat is a 34 foot Luhrs Express Open with twin Caterpillar diesel engines for fast and reliable travel to and from the fishing grounds. For comfort, the vessel has hot and cold pressurized water, enclosed head with shower for privacy, AC and Heat, Fridge, microwave, electric stove, ice maker, stereo, flat screen TV with DVD player, and a 6 KW generator. All the latest Electronics such as radar, VHF radio, 3 chartplotters, and the latest sonar with structure scan transducers which actually show a “picture” of the bottom. No more bumpy colors, but actual images of the bottom and its contents for more reliable fishing and accuracy.